Overview The posterior tibialis muscle originates on the bones of the leg (tibia and fibula). This muscle then passes behind the medial (inside) aspect of the ankle and attaches to the medial midfoot as the posterior tibial tendon. The posterior tibial tendon serves to invert (roll inward) the foot and maintain the arch of the foot. This tendon plays a central role in maintaining the normal alignment of the foot and also in enabling normal gait (walking). In addition to tendons running across the ankle and foot joints, a number of ligaments span and stabilize these joints. The ligaments at the medial ankle can become stretched and contribute to the progressive flattening of the arch. Several muscles and tendons around the ankle and foot act to counter-balance the action of the posterior tibial tendon. Under normal circumstances, the result is a balanced ankle and foot with normal motion. When the posterior tibial tendon fails, the other muscles and tendons become relatively over-powering. These muscles then contribute to the progressive deformity seen with this disorder. Causes As discussed above, many health conditions can create a painful flatfoot. Damage to the posterior tibial tendon is the most common cause of AAFD. The posterior tibial tendon is one of the most important tendons of the leg. It starts at a muscle in the calf, travels down the inside of the lower leg and attaches to the bones on the inside of the foot. The main function of this tendon is to hold up the arch and support your foot when you walk. If the tendon becomes inflamed or torn, the arch will slowly collapse. Women and people over 40 are more likely to develop problems with the posterior tibial tendon. Other risk factors include obesity, diabetes, and hypertension. Having flat feet since childhood increases the risk of developing a tear in the posterior tibial tendon. In addition, people who are involved in high impact sports, such as basketball, tennis, or soccer, may have tears of the tendon from repetitive use. Inflammatory arthritis, such as rheumatoid arthritis, can cause a painful flatfoot. This type of arthritis attacks not only the cartilage in the joints, but also the ligaments that support the foot. Inflammatory arthritis not only causes pain, but also causes the foot to change shape and become flat. The arthritis can affect the back of the foot or the middle of foot, both of which can result in a fallen arch. Symptoms Many patients with this condition have no pain or symptoms. When problems do arise, the good news is that acquired flatfoot treatment is often very effective. Initially, it will be important to rest and avoid activities that worsen the pain. Diagnosis Perform a structural assessment of the foot and ankle. Check the ankle for alignment and position. When it comes to patients with severe PTTD, the deltoid has failed, causing an instability of the ankle and possible valgus of the ankle. This is a rare and difficult problem to address. However, if one misses it, it can lead to dire consequences and potential surgical failure. Check the heel alignment and position of the heel both loaded and during varus/valgus stress. Compare range of motion of the heel to the normal contralateral limb. Check alignment of the midtarsal joint for collapse and lateral deviation. Noting the level of lateral deviation in comparison to the contralateral limb is critical for surgical planning. Check midfoot alignment of the naviculocuneiform joints and metatarsocuneiform joints both for sag and hypermobility. Non surgical Treatment Flatfoot deformity can be treated conservatively or with surgical intervention depending on the severity of the condition. When people notice their arches flattening, they should immediately avoid non-supportive shoes such as flip-flops, sandals or thin-soled tennis shoes. Theses shoes will only worsen the flatfoot deformity and exacerbate arch pain. Next, custom orthotics are essential for people with collapsed arches. 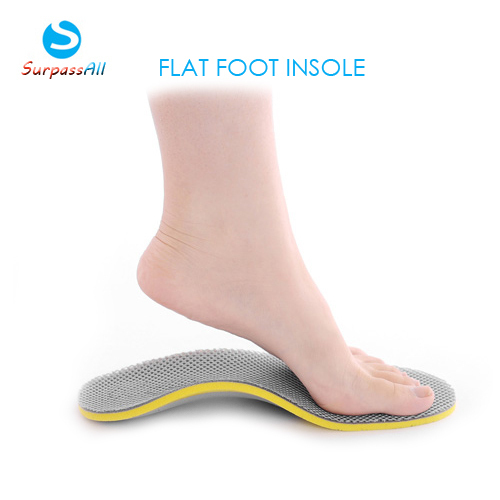 Over-the-counter insoles only provide cushion and padding to the arch, whereas custom orthotics are fabricated to specifically fit the patient?s foot and provide support in the arch where the posterior tibial tendon is unable to anymore. Use of custom orthotics in the early phases of flatfoot or PTTD can prevent worsening of symptoms and prevent further attenuation or injury to the posterior tibial tendon. In more severe cases of flatfoot deformity an ankle foot orthosis (AFO) such as a Ritchie brace is needed. This brace provides more support to the arch and hindfoot rather than an orthotic but can be bulky in normal shoegear. Additional treatment along with use of custom orthotics is use of non-steroidal anti-inflammatories (NSAIDS) such as Advil, Motrin, or Ibuprofen which can decrease inflammation to the posterior tibial tendon. If pain is severe, the patient may need to be placed in a below the knee air walker boot for several weeks which will allow the tendon to rest and heal, especially if a posterior tibial tendon tear is noted on MRI. Surgical Treatment If surgery is necessary, a number of different procedures may be considered. The specifics of the planned surgery depend upon the stage of the disorder and the patient?s specific goals. Procedures may include ligament and muscle lengthening, removal of the inflamed tendon lining, tendon transfers, cutting and realigning bones, placement of implants to realign the foot and joint fusions. In general, early stage disease may be treated with tendon and ligament (soft-tissue) procedures with the addition of osteotomies to realign the foot. Later stage disease with either a rigidly fixed deformity or with arthritis is often treated with fusion procedures. If you are considering surgery, your doctor will speak with about the specifics of the planned procedure.